Objective: Jesus loves me so much that He died on the cross, was buried, and rose again. Verse: I John 3:16 - This is how we know what love is, Jesus Christ laid down His life for us. - The Tallest of Smalls is a story by Max Lucado about Jesus' unconditional love for us. (Using a premade crown, ask the child to identify the object that you have on your head or in your hands.) Who would wear a crown? What does a king do? Jesus would be a great king. He's kind and fair, and He loves us all very much. Many people wanted Jesus to become a king on earth. The people wanted Jesus to lead an army and take over the country and fight the Romans. But Jesus said no. Jesus preached peace because He knew God wanted Him to be the King of Heaven not earth. Even though He could have been king, Jesus chose to die for us so we could be forgiven. Make a paper crown as a reminder that Jesus loved us enough to die on the cross and He is now the King of Heaven. Precut a strip of paper the diameter of the child's head. Allow the child to decorate before stapling into a crown. There are several ways to teach your child to tie her shoes. Here is an idea from the web: Idea #1. No matter which method you choose, stick with it. Make sure that you and the child are side by side and not opposite each other. Adult shoe strings are easier to tie than a child's because they are longer. Break down the process. This week focus on the first two steps. Start by crossing the string to make an "x." Then work on tucking the string under and pull. - Week 32 focuses on the kick characters K and k. Start by creating the characters using play dough snakes or pipe cleaners and move to writing the characters on the Kick Worksheet to show the similarities between the letters. - On 1” Tracing Paper, have the child write number 0-10. Draw a box for each number and add the green and red dots if needed. Have your child send a card to someone. Help the child write short sentences and then sign his name. Allow your child to assist in addressing the envelope - especially the return address. Cut, color, and finish the My Brown Book. Help the child read the lines. - Dye Easter eggs to review and mix colors. - Decorate the Egg worksheet with string, glitter, buttons, and other decorative items. Make Hot Cross Buns - Talk about the significance of the cross. Teach pencil control with the Maze 7. 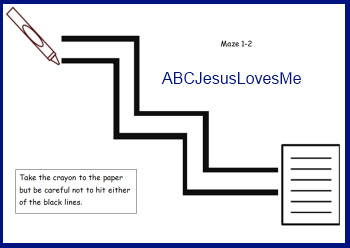 Instruction the child to keep the pencil from hitting the lines while doing the mazes.